The massive earthquake that struck Chile over the weekend was a devastating reminder of the potential hardship of life on the hardened crust of a giant molten rock hurtling through space. The Chilean quake measured in at an incredible 8.8 on the Richter scale, culminating in the mind-boggling release of 15.8 gigatons of TNT’s worth of energy. That’s almost a million times the power of the atomic bomb detonated over Nagasaki. 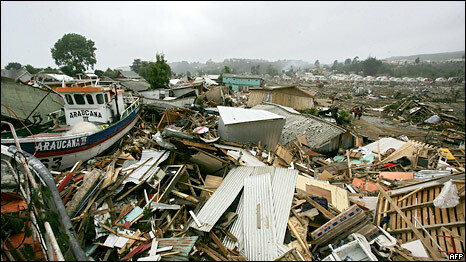 The quake was 500 times stronger than the one that devastated Haiti in January. It was so strong, it sped up the rotation of our planet. That’s right, it actually shortened the length of the day here on Earth. Don’t worry, no need to buy new calendars or anything. We’ve only lost 1.26 millionths of a second per day. That doesn’t quite amount to any fewer emails that you have to read or TPS reports that need collating. In the sense that a second can last an eternity, consider ninja-like reflexes are about 100,000 millionths of a second. So no one will miss a measly 1.26 microseconds. But how does an earthquake in Chile speed up the rotation of the earth? Basically, it changes its center of mass. In subduction zones like the one responsible for this recent quake, one tectonic plate slips below another into the Earth’s molten mantle. As the outer crust becomes liquefied, the mass of the earth is redistributed slightly. This causes the imaginary line that denotes the true center of mass for the entire planet to move – in this case by three inches. The closer this line is to our planet’s axis of rotation, the faster it spins. As cliché as it may be, the spinning figure skater is an effective and apropos analogy. As the skater tucks in her arms, her center of mass moves closer to the center of her rotation, and she speeds up. As she moves her arms outwards, the inverse happens and she slows down. This got me pondering how much mass needs to be redistributed around the Earth for me to get that extra hour of sleep I’ve lost somewhere. It’s tantalizingly worth global extinction. ~ by Wil Finley on March 2, 2010.